The building of bathhouses in the regions around the Mediterranean had a long history. It started in Greece as additions to gymnasia or palaestra (Olympia, fifth-fourth century BC). The Romans continued the tradition with balnea (baths) in private villas, like the Villa of Scipio Africanus near Literno. Natural hot springs were often used to provide water for the baths and ingenious water systems channeled the water down the hills. The engineering skills of the Romans were most helpful for a practical execution of these works. A psychological element might have been present as well. The confrontation with the element water was a challenge in itself. The act of bathing was an emerging in the fluent world of multiplicity. 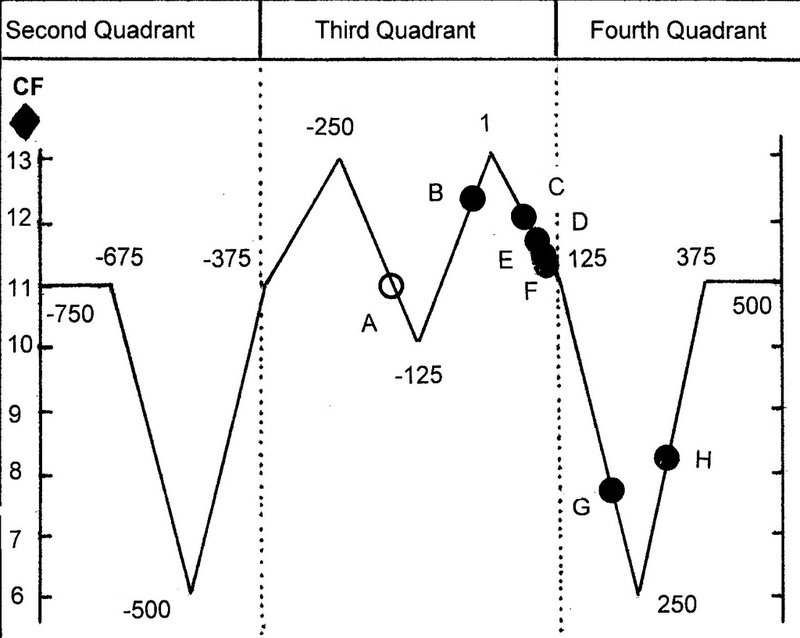 Water is the language of the Fourth Quadrant. The social use of bathhouses took off when the Roman Empire reached a position of power and wealth at the beginning of the Christian era. Agrippa opened in 17 BC the first official public bath on the Mars field in Rome. Vitruvius described the recreational buildings in his ‘De Architectura’ at the very moment that bathing became fully integrated in the Roman cultural presence. The habit of bathing was further propagated by Galenus (second century AD) in his ‘De Methodo medendi’ (The Therapeutic Method, Galen’s celebrated textbook in the Middle Ages). The design of the baths was adapted to the various steps, which were necessary in the recreational process. The first activity by entering a Roman bathhouse was to visit a dressing room, called the Apodyterium. Next came a stay in a hygienic area, used as preparation of the bath itself, with (two) warm water basins, the Tepidarium. The hot bath or Caldarium was situated on the south or south west side of the building, to take profit from the warmth of the sun. After the caldarium followed a cooling down in the Frigidarium, or cold bath. Further exercises could be done on the exercise court (palaestra) or in an open water basin (natatio). The plan of the restored bathhouse in Antioch (fig. 317) is a blueprint for many similar thermen throughout the Empire, from Antioch to Bath in England. Sometimes the actual bath areas were extended with additional rooms and courtyards, etc., and arranged in a different way. Fig. 317 – The plan of a restored bathhouse C in Antioch (SE Turkey) as given by Doro LEVI (1947). His well-documented book ‘Antioch Mosaic Pavements’ (Vol. I/II) is a display of tetradic motives, both in the ground plans as in the many mosaics, which covered the bath houses. The four division of Caldarium (hot bath), Tepidarium (hygienic area), Frigidarium (cold bath) and Exercise Court (with Natatio) is visible along the longitudinal axis. A three- and five divisions dominate on the transversal lines. 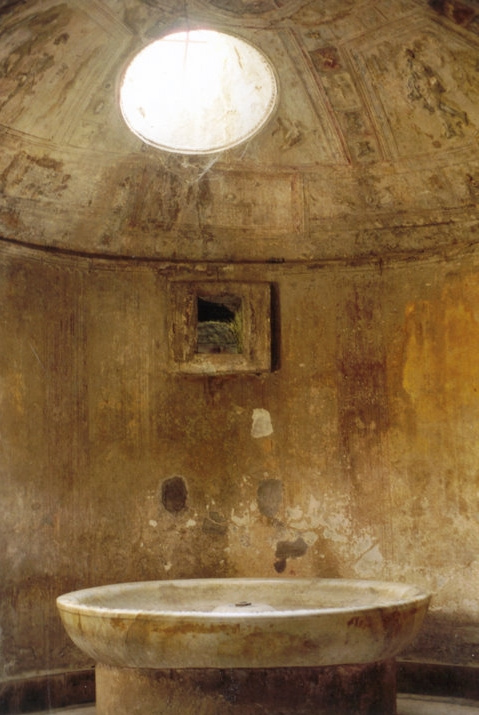 The bath in the Frigidarium has the typical octagonal shape, which found its way in the Christian baptisteries. The Thermen of Caracalla (212 – 216 AD) and Diocletian (298 – 305) in Rome (fig. 318) have a central four-division along a longitudinal symmetry axis (C – T – F – N) in common and show large lateral extensions. The division of the front (in plan) is brought up to thirteen (Caracalla) and seven (Diocletian). The thermen of Diocletian were the product of the endless possibilities of brickwork as building stones. Fig. 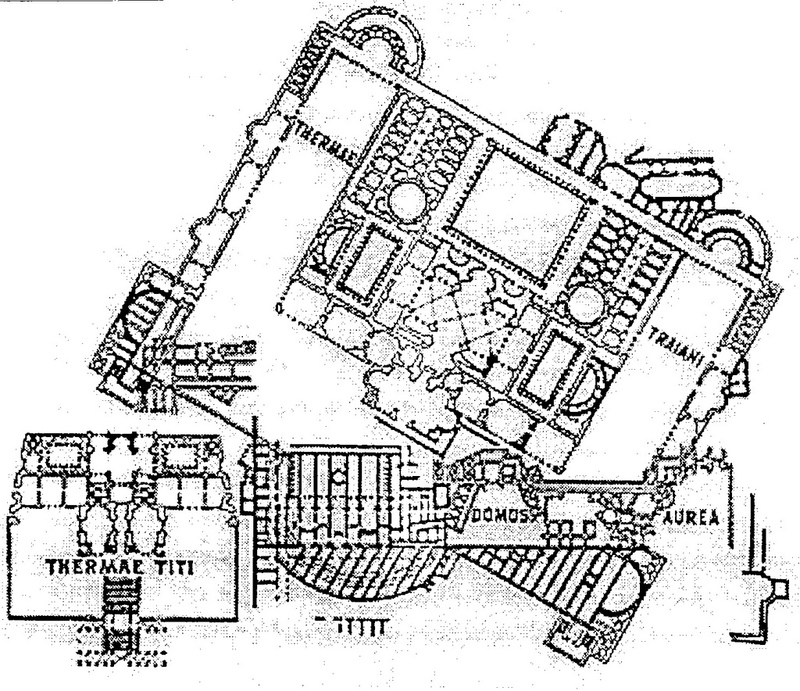 318 – The plans of two large thermal complexes in the city of Rome as they were built by the Roman emperors Caracalla, early third century (top, 1) and Diocletian, early fourth century (bottom, 2). 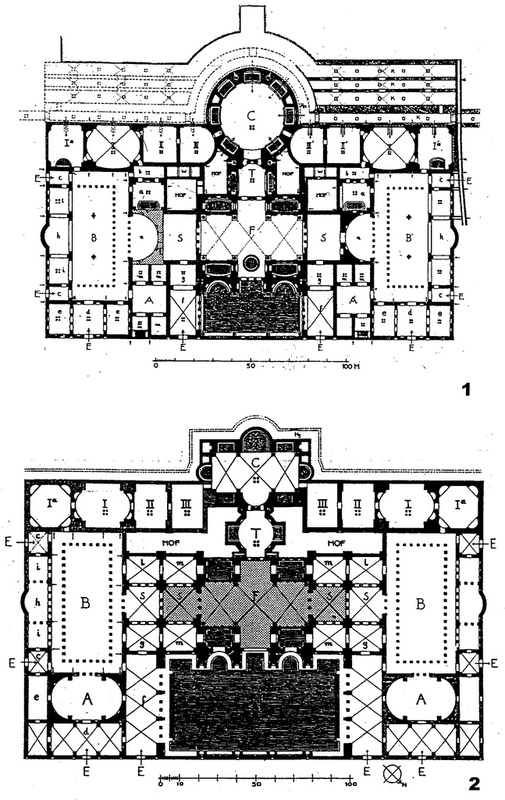 The bathes epitomize the persistence of the major four-fold scheme of functional rooms (C – T – F – N) along a symmetry axis as architectonic features. Different types of arrangements, either in a linear or circular fashion, were known from other parts of the Roman Empire. Inventive use of brickwork can also be seen in the Imperial baths of the city of Trier (Germany), which were built under the rule of Constantine the Great 306 – 337 AD). The complex was the largest Roman baths (260 x 145 meters) outside Rome itself (fig. 319). Fig. 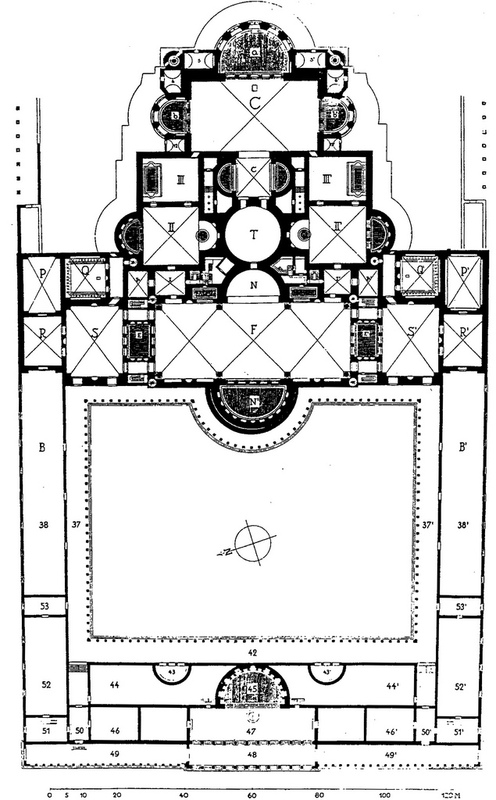 319 – A plan of the Imperial Baths in Trier (Germany) shows the symmetrical lay-out and an elaborate development of the four-fold scheme of Caldarium (C), Tepidarium (T), Frigidarium (F) and Natatio (N). The Imperial Baths were one of three bath houses in Trier (Augusta Treverorum) and constructed during the reign of Constantine the Great (306 – 337 AD). Only the eastern side has survived as a ruin. The external masonry, with alternating blocks and brickwork, is of architectural importance. The history of Roman thermen and baths, seen as visible architectural unity through the eyes of a European observer at the beginning of the twenty-first century, covers a time span of at least three hundred years. The roots can be found in the thermal resorts associated with the volcanism of the Vesuvius (ASSKAMP et al, 2007). The seaside resort of Baiae, in the Bay of Naples, was already mentioned by the Roman writer Livy (around 59 – AD 17, in: Ab Urbe Condita). He described (Livy, 41.16.3-4) the partial paralysis of the consul Gnaeus Cornelius Scipio and its failed cure at Aqua Cumanae in 176 BC. (YEGUL, 1996). The Stabian baths in Pompei, dating from the second century BC, were also long known as a place of cure and relaxation. Caldarium and atrium in Pompei. Photo by Marten Kuilman (2000). The (unofficial) start of large scale building of public bathhouses was made by Agrippa in Rome in 25 BC. The dominant presence of these projects came to an end in the thermen of Emperor Diocletian, finished around 305 AD. 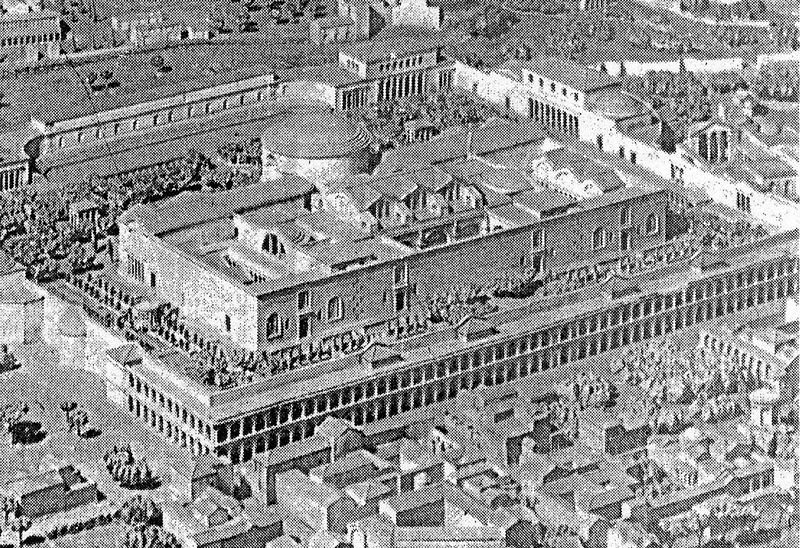 Other bathhouses were built and/or restored and were still in use after that time, but they never reached the grandeur of the baths of Diocletian (fig. 320). Fig. 320 – The presence of large public baths in Rome are given here as architectonic markers on the CF-graph of the Roman cultural history. The thermo-mineral resorts in the region around Baiae (Bay of Naples) and the Stabian bathes in Pompei (second century BC) are precursors of things to come (A). The following imperial thermae were situated in Rome. B. The baths of Agrippa (27 BC), constructed during the reign of Emperor Augustus; C.The baths of Nero (62 AD); D. The bath of Titus (80 AD); E. The baths of Domitian (95 AD); F. The baths of Trajan (Thermae Traianae, 109 AD); G. The baths of Caracalla (217 AD) and H. The baths of Diocletian (305 AD). Marcus Vipsanius Agrippa (64/63 – 12 BC) was Roman governor for Gallia and established forts and housing in Cologne (Germany). The place, then known as Colonia Claudia Ara Agrippinensium (CCAA), became a retreat for army veterans, who had served for twenty years or more (called a stratotopion). The bathhouse of Agrippa can still be visited underneath the Gross St Martin Church in the center of Cologne. It may qualify as one of the earliest public bathhouses and marks the beginning of similar buildings all over the Roman Empire. Agrippa was a close friend of emperor Octavian, who ruled under the name of Augustus between 27 BC – 14 AD, and when Agrippa moved to Rome as a consul, he was in command of large building projects to improve the city. The Pantheon – in its pre-Hadrian version – took shape together with the nearby Basilica of Neptune. The latter building contains all kinds of sea motifs, like shells, dolphins and Neptune’s tridents. The god Neptune was the Roman equivalent of the Greek god Poseidon and was celebrated by sailors for a safe voyage. The baths of Neptune in Ostia, with their splendid mosaics, bear witness of the devotion to the god of the sea. The Romans also worshiped Neptune as a horse god, Neptune Equester, patron of horse racing. Agrippa had every reason to be grateful for Neptune, since he had risen to fame after he won the naval engagements of Mylae and Naulochus in 36 against Sextus Pompeius and his earlier fight in the naval battle of Actium (31) against Marc Antony and queen Cleopatra VII Philopator of Egypt. The Baths of Agrippa must have measured about 90 x 120 meter and were finished in 19 BC. The original complex was destroyed by fire in 80 AD, but was rebuilt by Emperor Hadrian (117 – 138). The Thermae Agrippae were then incorporated in the (new) basilica of Neptune and are hardly visible now, except for a curving wall of brick in de Via dell’ Arco della Ciambella. A further restoration of the bath complex of Agrippa took place by emperor Constans in 344/345, proving that the cult of bathing was still active in that time. The time span from Emperor Caligula (37 – 41) to Domitian (81 – 96) is not only known as the period of Roman Decadence, but was also the time of extensive building. Historians have to realize that during times of leisure and squandermania of some, others worked hard to realize the large building agglomerates, which were set in motion by planners and their financiers. Bathing complexes and their elaborate systems to provide the water by aqueducts, pipelines, basins and cisterns became the expressions of challenging engineering projects. Water and water management were major issues during this time. Emperor Augustus had set the pace when he performed mock sea fights, or naumacia, as reported by the Roman writer Suetonius in his ‘Lives of the Caesars’ (The Twelve Caesars): ‘Augustus surpassed all his predecessors in the frequency, variety, and magnificence of his public shows. He says that he gave games four times in his own name and twenty-three times for other magistrates, who were either away from Rome or lacked means.’(…). He also gave a sea-fight, constructing an artificial lake near the Tiber, where the grove of the Caesars now stands’ (Aug. XLIII.1). Agrippina, born in Cologne in 15 AD, initiated some hundred and seventy bathhouses in Rome. Emperor Nero (54 – 68), despite his bad reputation, continued the building program in Rome and his baths were finished in 61 AD. The baths of Nero stood to the west of the Pantheon. No traces of Nero’s baths remain, but they were mentioned in literature, in particular in a verse of Martial: Quid Nerone pejus? Quid thermis melius Neronianis’ (What worse than Nero? What better than his baths?). The baths were incorporated in a restructuring project by Alexander Severus (208 – 235), the last Syrian emperor, who ruled from 222 until he (and his mother) were murdered by his troops in 235. The enlarged version of the Baths of Nero became known as the Thermae Alexandrina (Baths of Alexander). The Roman Empire was left in disarray when Nero committed suicide in 68 AD. The ‘Year of the Four Emperors’ (69 AD; see fig. 8) – with Galba, Otho, Vitellius and Vespasianus at the helm within the time span of one year – was typified by a chaotic political situation, but building projects continued during these years of turmoil. The baths, which were constructed during the reigns of Titus (79 – 81), Domitian (81 – 89) and Trajan (89 – 117) competed with each other for size and supremacy (fig. 321). Fig. 321 – The bathing complexes of the Emperors Titus (80 AD) and Trajan (109 AD) follow the general design scheme of three/four major recreational areas (Caldarium – Tepidarium – Frigidarium and Natatio) along a central symmetry axis. The trend of ever-bigger sizes of the baths is clearly visible. The Domus Aurea, (Golden House) was a villa complex, created by Emperor Nero. He used land that came available after the great fire of 64 AD. 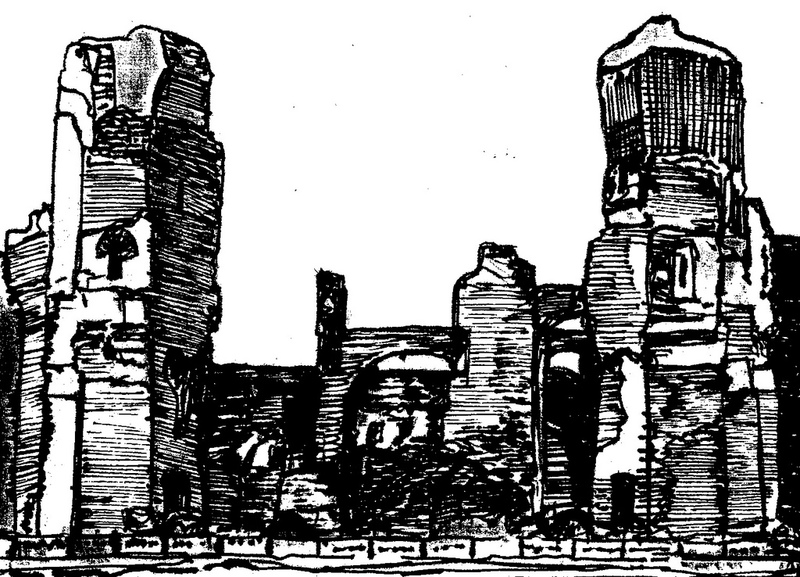 The buildings were later partly covered by the bath of Trajan. Emperor Titus was known as a good ruler, earning a reputation for generosity. He funded many building schemes. The Flavian amphitheater (Colosseum), which was started by Vespasian in 72 AD, was finished. Road building was another priority on which huge amounts of money were spent. He responded adequate to the eruption of the volcano Vesuvius (near Naples) in the year 79 and took decisive action after a devastating fire destroyed parts of Rome in the following year (80 AD). Titus, in a weird devotion to power, tried to establish a cult in honor of his predecessor Vespasian. The temple for this purpose was completed by Domitian and became known as the temple of Vespasian and Domitian. The baths of Emperor Marcus Aurelius Antonius (nicknamed Caracalla, 188 – 217 AD) were started by his father Septimus Severus in 206 AD and finished in 217 (fig. 322). The Thermae Caracalla were made of brick bearing masonry and reached gigantic proportions (225 x 185 meters with an estimated height of 38 meters). Cement mortar was used for the great arches and vaults. 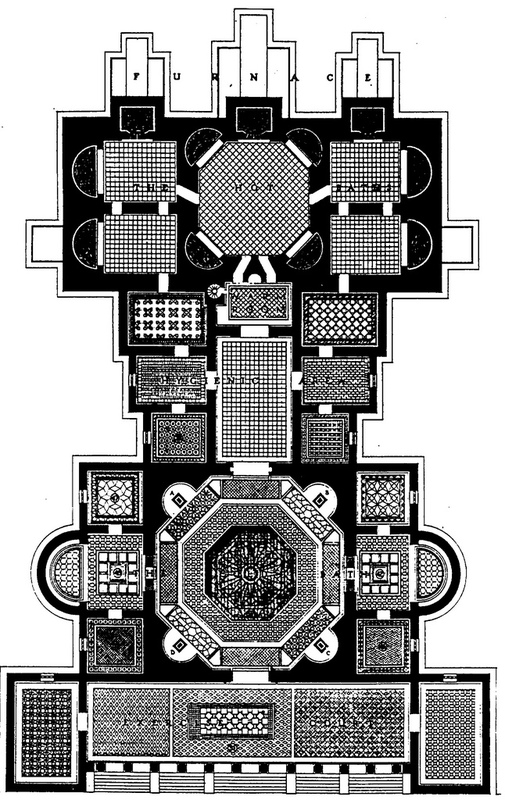 The ground plan of the baths of Caracalla followed the usual symmetrical scheme with a tetradic ground plan. Fig. 322 – The Baths of Caracalla were completed in 217 AD and in use until the sixth century. Numerous prominent baths were found away from Rome, like those at Bath (England; first century AD) and the imperial baths in Trier (Germany; 293 AD). The thermen of Baden-Baden (Germany) were started 69-79 AD by Vespasian, and improved by Caracalla 213 – 217 AD. Also the following complexes in Northern Africa are noteworthy: Timgad (Algeria; second century AD), the Hadrianic baths at Leptis Magna (Libya; 126/127 AD) and the thermen of Sbeitla (or Sufetula, Tunisia). Another group is found in Turkey: the baths of Faustina in Miletus (second century AD; Faustina was the wife of emperor Marcus Aurelius (121 – 180), the Roman bath at Isthmia (mid-second century AD, with the largest monochrome mosaic in the eastern Mediterranean (20 x 8 meters) depicting geometric patterns and Tritons with Nereids on their backs, surrounded by various sea creatures), the Skolastika Bath at Ephesus (initial construction from the first century, present ruins date from around 400 AD) and the baths at Aphrodesias (second century). This short overview of Roman bath houses needs further study and the relation between architecture and leisure – finding each other in a Fourth Quadrant environment – is certainly worth investigating in more detail.